McDonald’s is an American institution. Although I don’t eat fast food very often, I do find it tasty. Just don’t watch all those news reports about where the ingredients come from and how the food is made. All that matters is that it tastes good. Growing up I had tons of birthday parties at McDonald’s. Piles of their Happy Meal toys followed. Back to the Future: The Animated Series, Batman Returns, and The Super Mario Bros. Super Show! are all kids shows that I remember receiving Happy Meal toys from. If I remember correctly, the Delorean toy had actual sparks that shot out the back. The back wheel could easily come off too and posed a choking hazard. Ah to be a kid again during a time when safety wasn’t the top priority. The 1980’s was filled with a lot of popular football sets. You have rookie cards of Joe Montana, Dan Marino, John Elway, Warren Moon, Jerry Rice, Jim Kelly, Steve Young, and Barry Sanders. One of the most comprehensive football sets to come out of the 80’s wasn’t made by a major card manufacturer though. It was issued by McDonald’s. 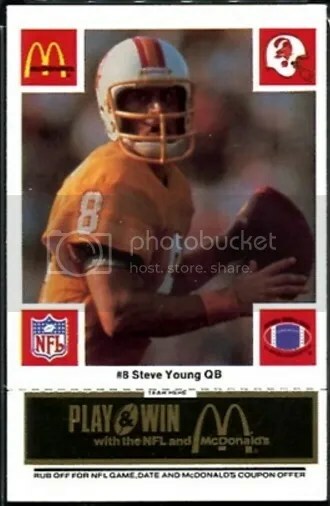 While making a purchase at McDonald’s during a specific 4-week period in 1986, you should have been given a football card with a coupon attached. These were regionally issued. That means McDonald’s restaurants near Philadelphia only gave out Eagles cards. Ones near Atlanta gave out cards featuring Falcons players. It goes on and on from there. You would need to make multiple trips to McDonald’s in order to obtain every player from that team. If the McDonald’s you were visiting wasn’t near an NFL team, they provided you with an All-Stars card. The All-Stars cards are exactly what they sound like. Instead of having cards from one team, it was a set made up of players from across the NFL. To make it even harder, McDonald’s decided to use different colored foil for the scratch-off portion of the card each week – week #1 blue, week #2 black (gray), week #3 gold (orange), and week #4 green. You would’ve needed to eat a hell of a lot of fast food just to get all the cards from your region. It gives me a heart attack just thinking about it. Given that this was 1986 and there was no internet, it would have been a monumental task to complete the whole set.